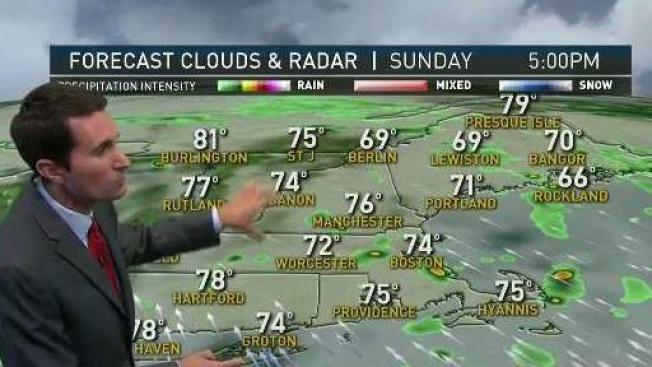 Sunday: Mostly cloudy, windy and muggy. Hit and miss downpours. Highs around 80. Sunday Night: Mostly cloudy, fog. Muggy. Hit or miss downpour. Lows in the 60s and 70s. Monday: Mostly cloudy, muggy. Hit and miss downpours. Highs around 80. A humid airmass will be overhead with numerous downpours over the next week. Temperatures will climb into the upper 70s to around 80 degree today. It won’t rain the entire day, but on and off tropical downpours will be likely. Developing thunderstorms may produce damaging wind gusts and an isolated waterspout or tornado. Localized flash flooding is also possible during the heaviest downpours. This tropical airmass will continue to provide us showers and thunderstorms with very heavy downpours. A single thunderstorm can drop an inch of rain in 20 minutes. Have that raingear handy - although you won’t need it the entire time. Temperatures will stay in the low to mid 80s most days. We are being slightly optimistic for next weekend. Our showers chances decrease slightly, so don’t rule out some beach time this coming weekend. It will stay warm and humid through that following Tuesday. Get ready to feel like Florida!